Pumpkin is full of good fiber and antioxidants, good for health vitamins, minerals, especially beta-carotinoids and Vit.C, magnesium. The pumpkin seeds have zinc, as good as almonds in fact.. In India it is used in curries and desserts, both raw and ripe fruits are used to make curries but you'l get the raw pumpkin easily in markets, with creamy white flesh as well as yellow to orange flesh. Yellow and orange ones should be preferred to cook as they have more carotene content. Some fat should always be used to cook pumpkin as the pigments are fat soluble and can be absorbed easily by the digestive system. Pumpkin is good for wt. loss too as it has less calorie for more food and is reported to lessen fat absorbtion by the body from other food sources too (so it's good to have lots of kaddu ki sabzi with puri as the fat from puri will not be absorbed completely. You get my point. 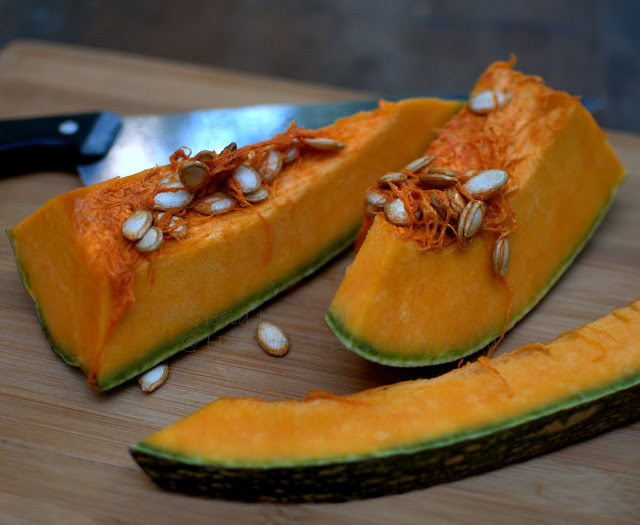 Here I have used raw pumpkin which has fresh green skin and a deep yellow flesh, so no need to remove the skin and you get the carotenes too. Recipe is simple and can be made with a southern touch if you add curry patta in it (which is good for wt. loss too) addition of tamarind extract adds to the antioxidant content. Deliciuous food that is superbly healthy too. recipe is simple and needs a few ingredients..
cubed pumpkin with skin 400 gm. Heat oil in a kadhai and tip in the asafoetida and the rai and methi seeds. Throw in the whole red chillies if using and curry patta (I did not use here) and ginger garlic paste, as soon as the rai crackles. After a few seconds add the pumpkin cubes too. Toss and mix. Throw in the salt and turmeric powder and red chilly powder (if not using whole red chillies) and keep tossing and mixing. Lower the flame and cover, cook covered till the pumpkin is soft but not mashed. Pour in the tamarind water and cook covered for another couple of minutes. 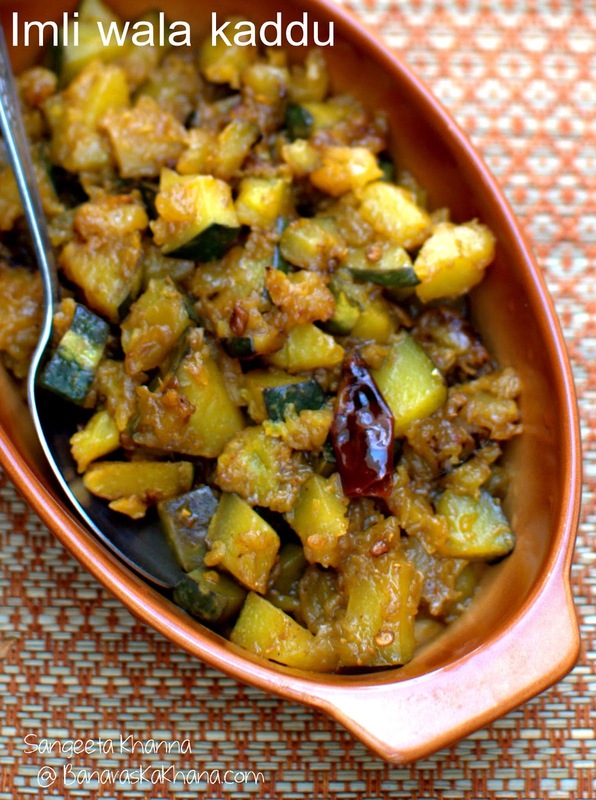 Serve hot with puris or chapatis. This imli wala kaddu will become a favourite I assure you. I have served it to people who hated pumpkin and they started loving this gorgeous vegetable after that. You can sprinkle some mint leaves or chaat masala over the subzi if you wish. Some bhuna jeera powder also makes it wonderfully flavourful if you want a chaat like concoction. 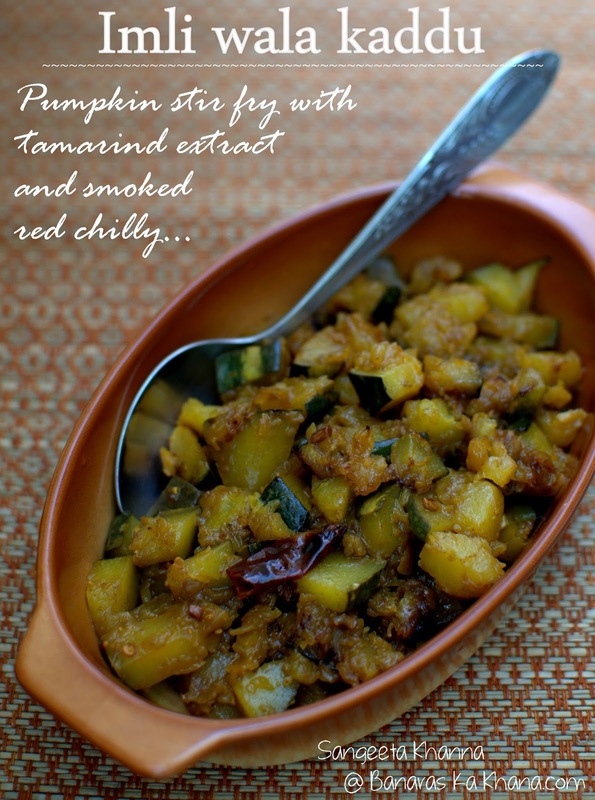 Tamarind does wonders to pumpkin trust me.